The Pearl District on First Thursday in July. 've been watching Portland change and grow for the last six years. The city changes weekly and, now that the city is on the verge of reinventing itself culturally, it's a good time to take stock of the various art districts. Five years ago "the Pearl" used to be a beautiful urban ghost town with lots of galleries and studios. Now it's about half full of condos with lots more galleries and a lot fewer studios. The net result? There are thousands of new walls that need stuff hung on them. Good paintings and photography seem to be selling very well. It's heartening that only the better work seems to sell. The question is, are these real collectors or simply acquirers? Logic would dictate that a few might become more serious. Being a serious collector requires a lot of information and experience. Such experience isn't easy to come by and the only strong candidate would be the Portland Art Museum's Contemporary Art Council, which takes trips and visits studios and galleries (note: I'm on its board). This development of more serious collectors is important because the success or failure of the Pearl increasingly serves as the barometer of Portland's strengthening claims to being the only major city on the West Coast where visual art is king. Elizabeth Leach Gallery... before it got busy. Seriously. The city's main artwalk, First Thursday, starts in the Pearl but two adjacent arts districts (Chinatown and downtown) also take part. First Thursday's crowds are a liability, though, and in many ways it means bigger business for the many Pearl restaurants and bars than the galleries. Two years ago I curated a show in a Pearl District gallery and it was a complete zoo. I can only compare it to diving into a mosh pit. It's terrible for looking at art, nice for seeing 10,000-plus art spectators. Galleries have adjusted with First Wednesday previews, but really there should be a way that some of the hospitality-industry dollars can be used to fund national advertising promoting the Pearl as a cultural district known for its galleries. It would have synergistic effects for galleries, hotels, restaurants, shops and bars. This has been a burning issue in my mind ever since Condé Nast did a tour of Portland and managed to visit the Pearl without mentioning that it is a gallery district. I do find it very interesting that no less than three banks are doing rotating art shows in their spaces but, if you want to go beyond schlock, get some expert help. Maybe a full-time curator is overkill, so I'd suggest getting ahold of one of the sharper artists in town to curate their peers. Also, it isn't unheard of for big banks to create small, high-quality art galleries with a part- or full-time curator and I'd like to see one of these new banks take on that kind of project. Also, everyone in the Pearl should recognize that the Pacific Northwest College of Art has no fewer than five galleries open to the public on its campus; all are free and open seven days a week. What needs work: still too many galleries bloated with midlevel artists well past their best days; also, this major district lacks a major national-level art exhibition institution. A kunsthalle is needed, although PNCA's Feldman Gallery periodically does the trick. 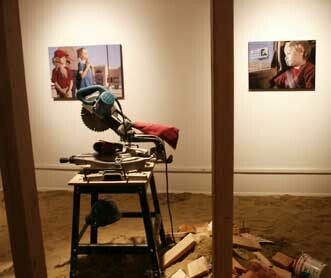 Artist Zanapon with film crew at Compound Gallery. This area directly east of the Pearl has steadily grown in strength as an art district. 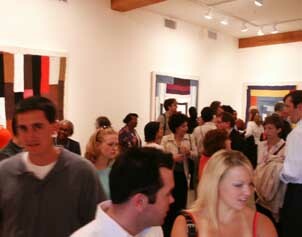 In fact, it has the greatest concentration of galleries in the city. Sure, most of them are scrappier than the blue chip Pearl, but it is definitely fun. 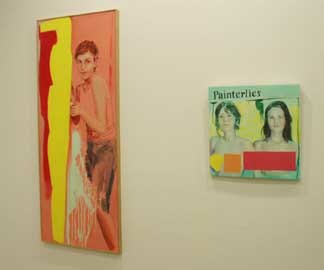 For years the 16 artist-operated Everett Station Loft galleries have held down the fort and the established Butters Gallery moved into a space near the onetime PCVA Hall. But now Ogle, Compound, Motel and backspace (all hybrid retail outfits with dedicated gallery spaces) have applied the super-flat leveling of commerce and fine art successfully. Motel has become an increasingly serious gallery, with a well-defined aesthetic that some of the blue chip galleries might learn a thing or two from. 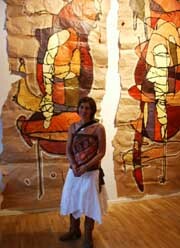 Epitome gallerist Niky Kriara Peterson. With the Chinese garden and the looming possibility that the new Portland Art Center will move here as well, Chinatown is hip but spotty. So far it's more punk style than substance ... very East Village meets Otaku. It should be noted that the Everett Station Lofts have been becoming more serious again, with a solid show by proprietor Niky Kriara Peterson at the larger, recently moved Epitome Gallery. Pepper Gallery will also be moving into larger digs and I'm very curious to see what this new wave of young Portland artists comes up with. More artists just keep coming and having a good ESL loft show is an established way to get noticed. What needs work: more ESL galleries need to be more serious and open at least on Saturdays. Daniel Kaven: too heavy handed at Gallery 500, but still worth the trip. Although a mass exodus to the Pearl District has been threatened, Augen, Froelick and a few others hold down the fort downtown. Gallery 500 has become an increasingly serious venue but has yet to develop a stable beyond Daniel Kaven, whose July solo show, Divorce, is ambitious if slightly too literal. A chop saw is a pretty heavy-handed metaphor for a divorce. Still, it's a good show from a developing artist. The gallery has become the place, though  where else can you see Raymond Pettibon play righteous punk rock on a black Les Paul? Last but not least, the new Chambers Gallery opened to an energetic crowd, from octogenarians to skaters, and it was interesting to see such diversity. This gallery's stable is also up for grabs. What needs work: strong artists' stables need to be defined; other galleries need new blood to liven things up. Zack Kircher takes on Elizabeth Peyton at Savage Art Resources. 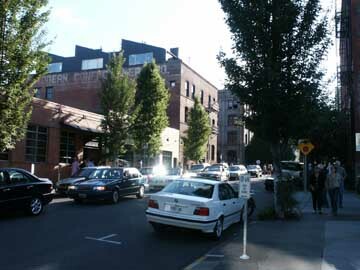 This newly named arts district has tons of industrial studio spaces and has hosted a majority of the most significant art events in recent Portland history: Donut Shop 1, Affair @ the Jupiter Hotel, the Best Coast, Meeting People, Process and, most recently, Taking Place  which kicked off in July. The Hall Gallery (620 SE 3rd) has been the site of many of the more interesting warehouse shows in town. When Savage Art Resources located here it sparked a rash of art-space openings: the New American Art Union, Newspace, Holocene and Portland Art Center. NAAU and PAC have nice spaces but have yet to find curatorial voices that don't seem underdeveloped and gimmicky in a W.C. Fields kind of way. Sometimes they work, though. And this month, NAAU's Joe Macca show was hilarious and took risks. Newspace has also been putting on excellent shows lately and I'm waiting to see how well the new Lint Gallery does. Savage Art Resources is by far the most sophisticated player here and often offers both cutting-edge verve and refinement that I wish I'd see more of in the Pearl. They've weathered a disastrous gallery closing in the Pearl and everyone is curious to see if they'll start representing more of the sophisticated young bloods in town. The last two shows, by Jacqueline Ehlis and Zack Kircher, have set the local standard to beat. Others have had some strong works but the shows weren't as sustained. Lastly, the second annual Affair @ the Jupiter Hotel art fair will be quite the event Sept. 30, with lots of national galleries, white columns and Mona Hatoum. The gallery walk is the first Friday of every month. What needs work: sparse and inconsistent; go to Savage first then decide who else steps up. Let's make this short. Last Thursday is a street party with one worthy stop: Guardino Gallery. The area isn't so serious and seems determined to stay that way. The John Ross in the South Waterfront. It isn't even built yet, but this $2 billion development of Vancouver, B.C.- style razor towers doesn't have any preexisting community and probably needs some high-end visual art gallery space to legitimize and liven up what will be the king of the high-rise condo districts. The condos are selling like crazy. People want to be here, but it isn't Portland if visual arts are not visible in a high-rent district. Portland is growing up fast.